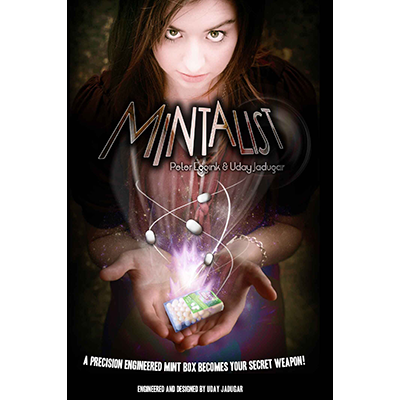 Today, when you order "Mintalist by Peter Eggink and Uday Jadugar", you'll instantly be emailed a Penguin Magic gift certificate. You can spend it on anything you like at Penguin, just like cash. Just complete your order as normal, and within seconds you'll get an email with your gift certificate. Anytime you can do magic or mentalism with "organic" props ( coins, rings, or MINTS ) that they can handle, audiences don't bother connecting the dots to "PROP". The Mintalist box is gimmicked with a stealth secret, meaning it can't be seen. They handle the box and can't see anything other than a normal mint box ( ALL the mints are real and can be eaten) but it allows you to create magical routines that will fry any audience. As Entertainers, we are always asked to "show them something". Not many performers carry props when they aren't working, but if you're of the Eric Mead/Jeff McBride school of "Magician 24/7", you want to be able to perform what looks like impromptu magic at a moments notice. Mintalist allows us to do just that. 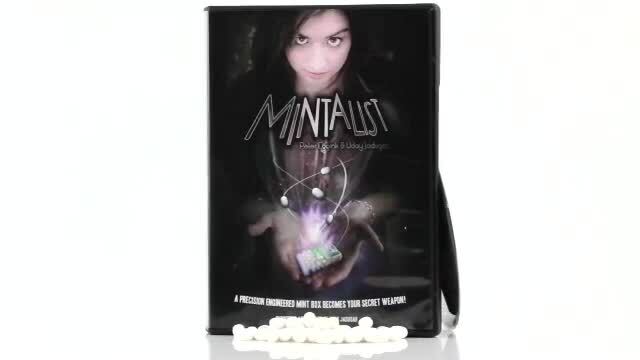 Most people carry mints already, so with Mintalist we're not having to carry anything extra. Next time a friend mentions to a someone or a group that you're a Magician or Mentalist, don't get caught off guard by not being able to show them something. Pop a mint in your mouth, pause and say..."well, let's try something"! It's perfect for Restaurant or Strolling Magicians as well! The DVD is beautifully filmed and chock full of ideas and tips to make this a must carry piece of magic! I'll say first off that what compelled me to buy this trick was that I was completely baffled by the way in which it was presented in the trailer. The effect seemed so impressive, and the presentation so clean, that I figured this has got to be an ingenious device. The product itself was not quite what I expected. The problem was that I was way over-thinking what the possible solution could be, when it is actually so incredibly simplistic that a five-year-old could probably design this. Not that it's a horrible trick, but considering the price, you could probably get a whole set of just as good of quality tricks in one of those kid sets you find in the toy store for less. The good thing about it is that it's a nice, organic kind of trick that uses an everyday object, which can often come off as more convincing to spectators. Now for the drawbacks: For one, the label on the box is very generic and unrealistic looking. That right there can start the performance off with immediate suspicion. It would be better if it had a genuine tic-tac label (obviously, there are probably copy write reasons for this), but I suppose a way around it is to switch out labels; this would be tedious, however. Another problem is that the box isn't the same scale as any tic-tac box that I've seen. Maybe there's a size sold somewhere that I don't know about. Also, there are four main routines and several bonus ones discussed in the DVD, but you can really only do one at a time per spectator as the reset needs to be done in private. Lastly, this is best performed for children or people who don't have a clue. Some clever people, like my fiancé, can easily get you caught in a sticky situation with this one. Overall, it's alright if you can get it at a super-super markdown. Ok to start, I'd like to say to any of the negative reviews below suggesting that the box is "too big" and the label is suspicious, you sound like my ex-girlfriend, quit b#tching!!! This prop is perfect for an impromtu situation calling for mentalism... Whats funny is there are christmas tic-tac boxes out right now with mixed flavours that are the EXACT same shape/size/design as the box provided, further more grab one of those boxes slowly peel off one of those labels and attach it to your prop box if your still OCDing about the label, VIOLA the B$tchfest has been silenced... were supposed to be magicians here... theres a solution for everything guys! 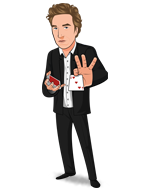 Overall if your a good magician you'll be using this daily! 3 - My own gimmick device was very filmsy, so I had to take it away to fix it. Though they do provide you with 'spare parts', I felt the construction of it was a bit filmsy without giving too much away. Overall, I'd say save your money and get something better if you're investing paying for the full price $40. Get it if you think this is honestly something you will be using frequently enough to justify investing $40 for one type of effect. Honestly, I think the method is cooler than the effect. I have neither glowing reviews nor stark criticism about this one. I won't be much help. First, the gimmick itself is a high quality one. Each unit has been designed solely for this effect. Serving a daily regular item, this is INVISIBLE. No-one will ever guess this thing is a miracle-maker. Of course, the unit might need some little practice to make the mechanism works smoother. After a while, it will be more comfortable to use. Second, the DVD is pretty much straight forward and complete. It shows how to take care of the unit, how to clean, replace or to operate it properly. With some great routines, they are very good starting points where you can expand and alter it into something new. Now, the handling. It is very simple and to the point. It does require some very little practice to remove the tacky move. However, there is no sleight of hand needed, period. Once they pour out the mints, and you show to them the box is just another mint box by shaking it, it's done. It's clean and innocent. There are people complaining about the size, the brand, the mechanism, etc. Ignore them. The size and brand? How many times we passed by shops where we found some unknown brands for mints? Mechanism, it won't give you a hassle, especially if you follow the instructions and recommendation on the DVD. I've used this and it has great reaction and endings. There are so many different things can be done with this small arsenal. The other good thing, the set will come with the replacement for the small parts of the gimmick. So you don't have to worry if this won't last long. It will last a lot longer than you might expected. My suggestion, if you are into close-up, street and mentalism magic. Get this. You don't have to bring it around because you're going to perform. You can use it for everyday thing to bring mints around. Offer people some mints, and when the time is right, go with the effect. Oh, the set-up and reset is basically very simple and quick. Just remember to keep the hygiene level because that's what we expect other people to do us as well. Get this, you won't regret it. This has gone to my everyday effect. Waiting in my pocket or my table for small miracles that other people don't expect to see. The reason I gave this a 4 stars is because the unit needs to be used for practicing before the mechanism works smoother. It doesn't mean it is not working. It is working but with more action-time, it will be just smooth. Imagine when you buy a pair of shoes. First few days, it is kinda tacky, but after that, it will just be more comfortable for you. Overall the effect is nice and it's a great concept however the gimmick design is just too far off compared to the real item. It is suspiciously larger than any mint container I could find making it rather difficult to acquire 'spare parts' and drawing attention to it under closer scrutiny. If the gimmick were better designed it would have been a home run. Sadly this will probably just go into the magic trick graveyard drawer. This trick gets great reactions...that is great reactions when it works. It didn't work several of the times that I had a spectator do it, so it doesn't really come across as overwhelming to tell a spectator "Uh, just kidding. I have no idea how many mints you have"
At least their customer support was good. I love the trick! It is one of the best gimmick ever. Recently I saw the presentation that Peter did with Dan, and I think it is the best way to avoid anything wrong can go wrong. You can do change of color or something else, just limited by your imagination. I received it and played the DVD. The secret is genius. I haven't tried it yet and am wondering if there are replacement parts in case I break something. I like this effect very much.